HOME > NEWS > “Heavy Ion Radiotherapy Guide” Website is now open! “Heavy Ion Radiotherapy Guide” Website is now open! The website “Heavy Ion Radiotherapy Guide” developed by a team, including Med in Japan, was launched online on November 1st, 2012. Initialized by Prof. Dr. Hirohito Tsujii, fellow radiologists from National Institute of Radiological Science and world-renowned expert on heavy ion radiotherapy, together with medical supervisors from all heavy ion radiotherapy facilities in Japan, the website is world first innovative site for advanced radiotherapy. The information regarding the heavy ion radiotherapy, treatment scheme, and the treatment facilities is illustrated with CG animation and user-friendly illustration. As for healthcare personnel, the detailed explanation about heavy ion radiotherapy is available with various medical publications and references. Moreover, the website “Particle Radiotherapy Clinic” was launched online at the same time the “Heavy Ion Radiotherapy Guide” website was launched. This clinic offers the second medical opinion service for patients who wish to receive the treatment by heavy ion beam. If you are interested in heavy ion radiotherapy, please visit the website. *The above are public opened in Japanese only. For international patients who want to receive the heavy ion radiotherapy, please contact Med in Japan for more information. Feb 10 Our website is now open! Nov 02 “Heavy Ion Radiotherapy Guide” Website is now open! 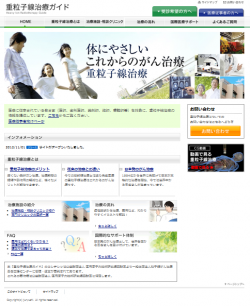 This site is managed by Emergency Assistance Japan Co., Ltd.